USFA Poster, Artist Charles Edward Chambers. Source: Library of Congress. Meatless Mondays is a recent global campaign aimed at lowering our overall meat consumption for our health and the environment. Believe it or not, the movement has a history stretching back to World War I. It all started with Herbert Hoover prior to his presidency… and it was originally Tuesdays, not Mondays, when Americans were asked to limit their meat consumption. 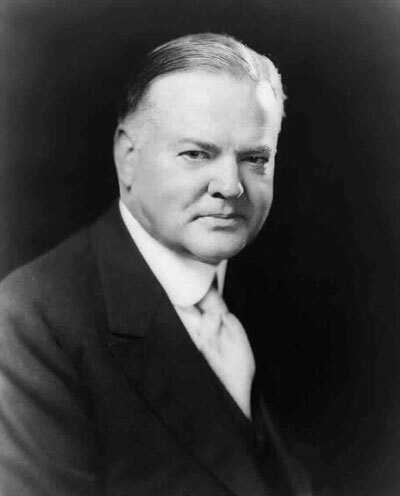 Herbert Hoover’s public reputation began long before he took on the role of 31st President of the United States. Born in Iowa and raised in Oregon, Hoover was part of the first class to graduate from Stanford University. After marrying his Stanford sweetie, Lou Henry, the couple relocated to China where Hoover’s degree in engineering earned him a job as the leading engineer of a private corporation. When Germany declared war on France just before his 40th birthday, Hoover was contacted by the American Consul General and asked to help stranded American tourists return home. In just six short weeks his efforts ensured the return of 120,000 Americans to the United States. His next task was to help feed the German overrun country of Belgium. As a result of his success, President Woodrow Wilson asked Hoover to leave Belgium in order to head the newly developed wartime Food Administration. Hoover took over the task in April 1917. 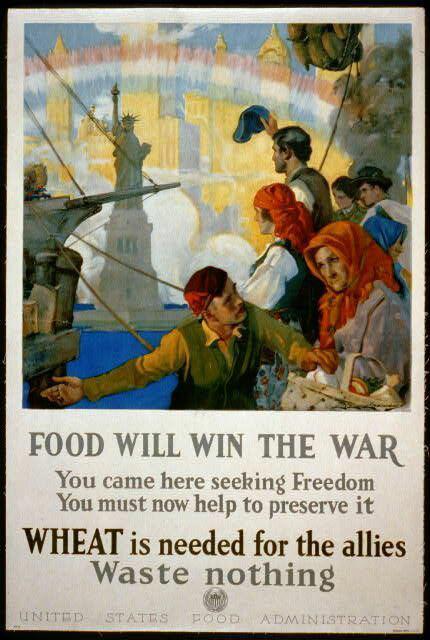 By the time the United States entered World War I, citizens of allied countries, including Belgium and France, were left starving. Much of the farmland of Western Europe was turned to battlefields and the farmers themselves became soldiers. Women, children and the elderly had no choice but to tend the remaining land themselves. 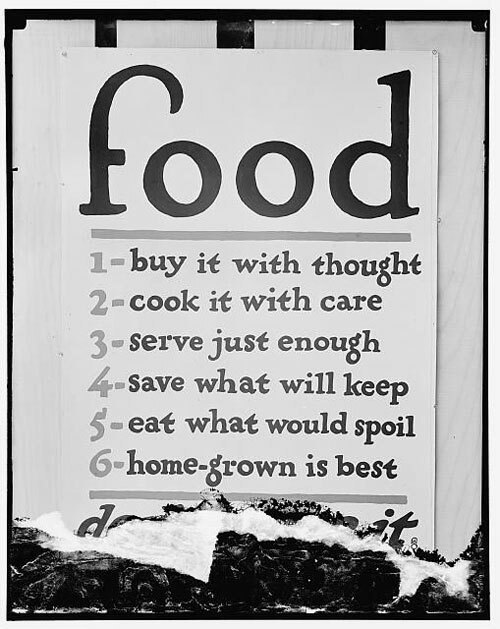 In an effort to care for struggling Allies and nourish US soldiers overseas, Hoover and the US Food Administration coined a slogan: Food will win the war. In lieu of rationing, the administration’s first campaign asked US citizens to cut back on meat, fat, sugar and wheat and to participate in Meatless Tuesdays and Wheatless Wednesdays. Our conception of the problem in the United States is that we should assemble the voluntary effort of the people… We propose to mobilize the spirit of self-denial and self-sacrifice in this country. When it comes to loving you! USFA Poster (ca. 1910-1920). Harris & Ewing, Photographer. Source: Library of Congress. Other foods were rationed at this time, including sugar, butter and fats (to learn more about wartime rationing click here). The Food Administration hung posters, published articles and held workshops, all in hopes of making the conservation transition a bit easier. Home economists at both the state and federal level were given the responsibility of showing how one food could be replaced with another without any loss of nutrition. For example, protein rich nuts were used in place of meat, while rye and corn flour were great substitutes for wheat flour. Because of their limited shelf life, fruits and vegetables were also encouraged, since they could not be sent overseas. The economists traveled, teaching techniques like drying and canning, and distributing pamphlets filled with helpful recipes and menu ideas. Waste was highly discouraged at this time, particularly due to the American reputation of being wasteful when it came to food. Some suggestions included using sour milk and buttermilk in baking and bones as a flavoring for soups and stock. Everyone was urged to clean their plate, which proved to be one of the simplest ways to get children involved in the movement. The lesson was taught in elementary textbooks; it has even been suggested that the favorite parental phrase, “Just think of the starving children in _____,” may have gained a foothold during this time period. Hoover’s campaign was an undisputed success and proved that he was, among other things, a humanitarian. The campaign continued during World War II when Presidents Roosevelt and Truman were called upon to help feed a war-torn Europe. Though Wheatless Wednesday has fallen by the wayside, Meatless Tuesdays have recently been revived and replaced by Meatless Mondays, an effort founded by advertising executive Sid Lerner in association with Johns Hopkins Bloomberg School of Public Health. The campaign has turned into a global movement, with a new slogan: The day all health breaks loose. 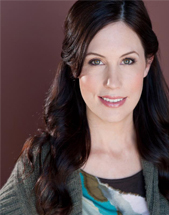 The newer version of the campaign supports health, nutrition, the environment and animal welfare. Monday is viewed as the day people are most likely to start new diets or give up bad habits, like smoking, making it ideal for a health campaign (the two M’s in Meatless Monday also have a nice ring to them). 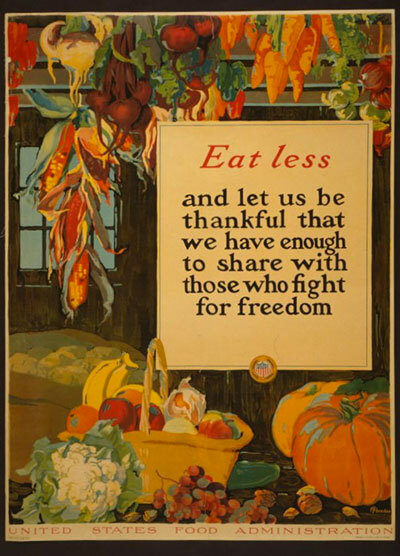 Many notable restaurants and renowned chefs are offering Meatless Monday menus, just like they did during World War I. Though the underlying message has changed, I find it heartening to see large groups of diverse people uniting for a common positive cause. “Herbert Hoover.” The White House, n.d. Web. 06 Aug. 2013. Leuchtenberg, William E. (2009). Herbert Hoover: The American Presidents Series: The 31st President. Times Books, New York, NY. Mullendore, William Clinton and Lutz, Ralph Haswell (1941). History of the United States Food Administration, 1917-1919. Stanford University Press. Van Hise, Charles Richard (1918). Conservation and Regulation in the United States During the World War. Cantwell Printing Company, Madison, WI. Explore our recipe database to find recipes you can prepare for Meatless Monday. Check out our Pinterest board for plenty of Meatless Monday recipe ideas from PBS and beyond. What was Cooking in Leonardo da Vinci’s Kitchen?